Honestly, if all we had to write with were notepads and typewriters, I’d be the most frustrated writer alive. I love technology and all the things it helps me do! So here are the 10 tools I’d have great difficulty living without. I’ve only had two screens for a couple of years, but now I don’t know how I’d manage without them. 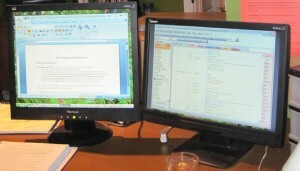 I’m often writing on one screen while checking an Excel file, the Internet, or a photo on the other screen. For me, right now, it tends to be the Notes program on my iPhone, but it’s normally been a small notebook. The key point is, never be caught without a way to capture an idea. Read more about idea catchers more here. I have two four-shelf bookcases filled with books on writing. Most, but not all, were published by Writer’s Digest. 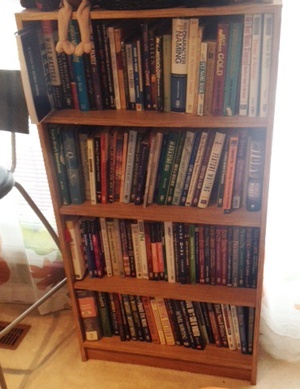 If you want to see what kind of books I have, you may be able to see some titles in this picture. I also have at least 10 floor-to-ceiling bookcases filled with books, from the classics to those from a variety of genres, including those in which I write. I love the way we can now do much of our research online. I’m sure that’s saved me thousands of hours over the last ten years. Yes, you should double-check everything, but overall, it’s a great time-saver. Over the years, I’ve created a number of templates that I use to plan just about everything I write. One of my Brainstorming Sheets is on the right. 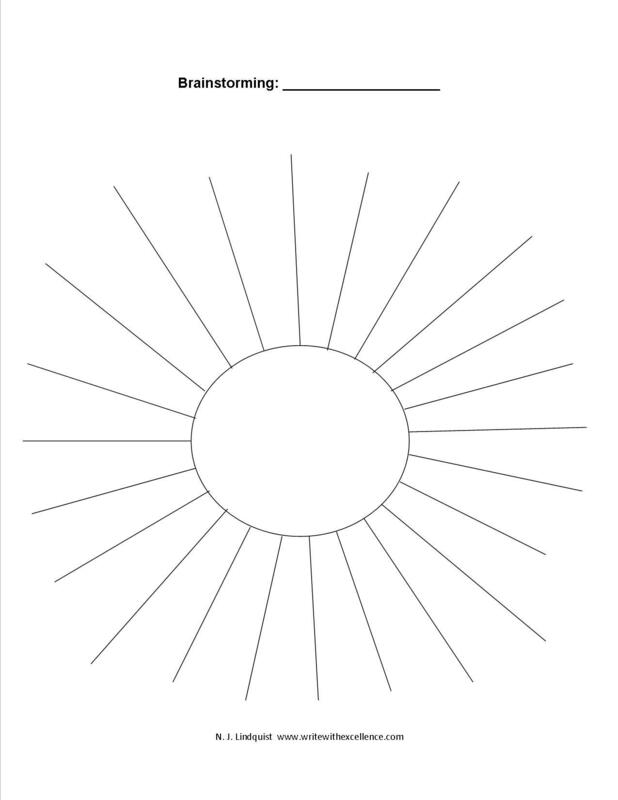 Download two of my templates here. While I still use paper files for keeping track of drafts and correspondence for every story or book, I use plastic bins when I have more information than can be kept in a file folder or on my computer. One bin per book is the norm. 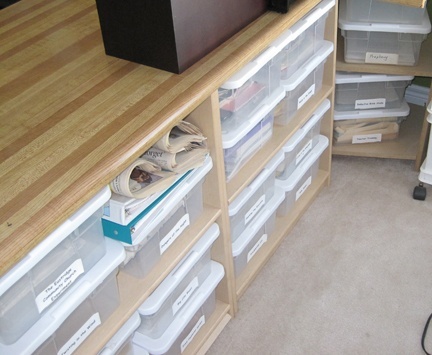 Learn more about how I use bins to keep my many ideas under control. I use Excel to keep track of anything that involves a list that can be sorted as well as details about my characters, timelines, motives, scenes, word count, and a host of other details. To see how I use Excel for my To Do list, check this recent blog on my writing goals. I just started using Scrivener to write last fall, and so far, I love it. 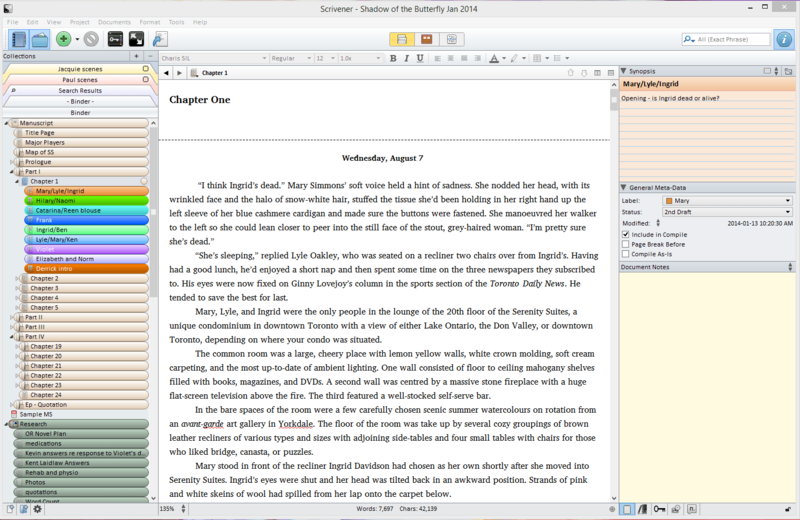 Nothing against Microsoft Word, but Scrivener was made for writers like me. It’s like a big binder rather than a writing pad. You can put everything in it, and I do. 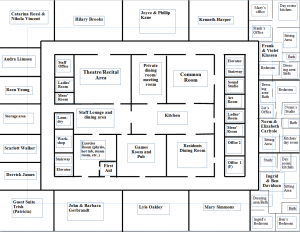 There are many places you can learn more about Scrivener, so I won’t go into detail here. This might be one place where a picture is worth a thousand words, so here are two pictures. The one on the right shows the full Scrivener screen for my 3rd Manziuk and Ryan mystery. The Binder (table of contents) is on the left, the writing area in the middle, and the Inspector, which acts like a mini-notebook, to the right. The second one shows the middle section being used a corkboard, showing different chapters. You can check Scrivener out here. I will mention that I found the book Scrivener for Dummies helpful because I find books preferable to videos. I keep this program open all the time. It’s a super place to pop random ideas, pictures, or just about anything I find on the internet. The best part is that it automatically includes a link so you can give credit or go back again. It’s also great for keeping ideas. I have a number of folders so I can choose where to put things. And it’s search function is terrific. No matter how disorganized I get when I’m really busy, I never lose anything. I also love the fact that it takes screen clips. The pictures of my screen with Scrivener open were both saved as pngs from the screen clippings in MS One Note. I don’t use this program as much as I used to (see below) but I do use it for some writing-related things. 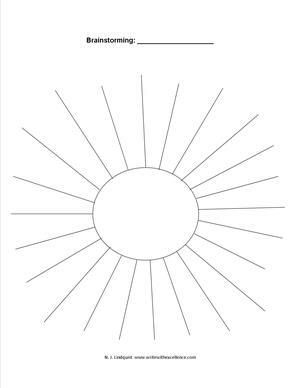 Like templates, diagrams, and maps. The picture to the right is a rough drawing of the floor of the building where my 3rd Manziuk and Ryan Mystery is set. It saves me no end of time and frustration to be able to visualize what I’m writing about. And if you don’t have InDesign or another top publishing program, MS Publishing is also great for creating posters and other promotional materials. 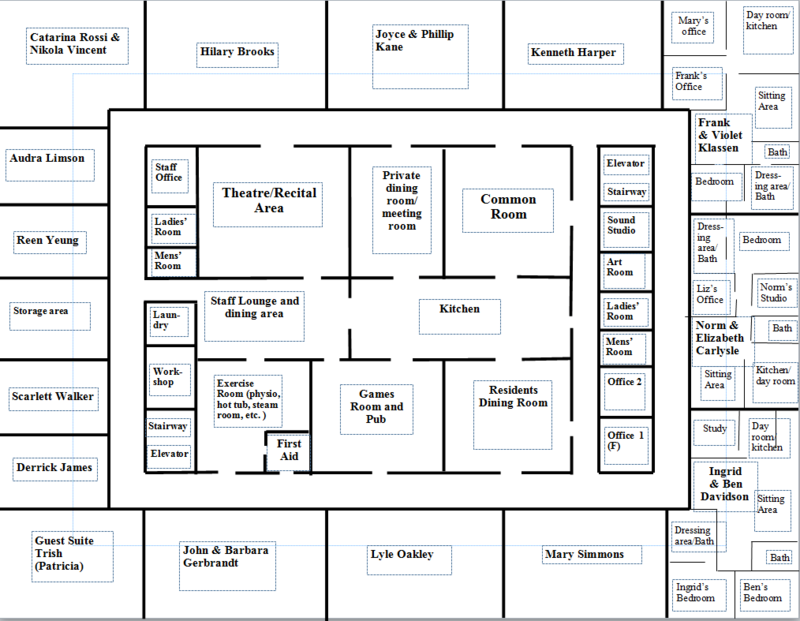 Because I’m an independent publisher as well as a writer, I make a lot of use of InDesign and Photoshop, etc. I use InDesign to lay out my books as print books and then e-books, and I also use it to create some of our marketing tools, including bookmarks and posters. Going back to having two screens, when I’m using InDesign, I honestly don’t know how I’d do it with only one screen, because it has a variety of style palettes that are also usually open; not to mention an associate program known as the Bridge. I hope this post has given you some ideas. Thanks N.J. Lots of great information as always. So interesting to read about how we all do things so differently to reach the same goal of producing writing we can be proud of. For sure, we’re all different. It might not look like it to a casual observer, but I just love being organized! Love OneNote, NJ, and I think Scrivener might turn out to be even better. Feeling a little overwhelmed right now, NJ. You are amazingly well organized, and I admire that. 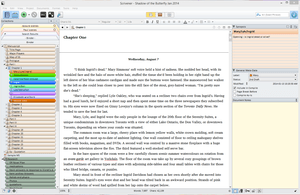 I, too, like the bin idea, and I will give Scrivener a try since so many here are lauding it. Thanks for all the great tips. Thank you, thank you, thank you for a wonderful list of tips!! What a great source of wisdom, Nancy. Can you make that into a workshop for WRITE! Canada? I’m going to download Scrivener, too. Just downloaded Scrivner trial. I’ve been thinking about it for a while. You pushed me into action, NJ. This was a great, helpful post. And I’m loving the shelves idea – love having a carpenter for a hubby! I don’t think you’ll regret trying Scrivener. Yeah, make your space totally functional if you can. Les isn’t a carpenter, but he isn’t afraid of tacking anything, and over the years he’s made me a number of useful things, starting with a three-piece sewing cabinet shortly after we got married. You just have to envision what you want to have in your space and how it might be made more useful. I like your plastic bins idea. Only trouble is, I’d need to find somewhere to store them. Do you save your research from book to book? When I took a continuing class from Chip MacGregor at Write! Canada some years back, he told us he destroyed all his old research notes after the book was out. I’ve never had the nerve to do that (even with my short articles). As for destroying stuff, eek! No way! I never get rid of anything. Ever! You never know what you might need some day. I love the idea of bins, too. I recently finished listening to Getting Things Done by David Allen and have been quite inspired to give new energy to organizing my world! I have a short list of immediate needs from IKEA and a long list of ideals and dreams. I’m going to have to check out Scrivener. So many people on the blog hop seem to swear by it. Thanks for the great list! Thanks for the comment, Leanne. Yeah, do check it out. I’m sure it isn’t for everyone, but given what I write and how, it’s perfect! Great blog. I am going to look into some of these. Yeah, everyone’s different, and it’s all about finding things that work for you. Thanks for the comment, Erin. Fantastic tools, N.J. I’ll have to check some of them out to help me better manage my writing. Thanks for sharing! Thanks for the comment Kim. What an inspirational entrepreneur you are. I have been lamenting losing InDesign a while back (long story) – I never though of using Publisher which I now have, Derr. 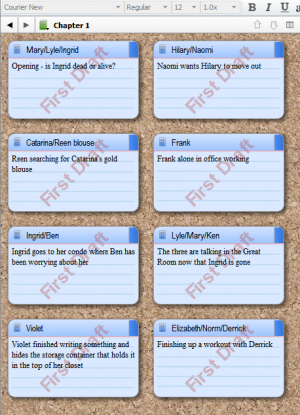 Also, I can see that sometime in the not too distant future I am going to fall in love with Scrivener. I didn’t know about OneNote either. So lots and lots learned. I decided to write about My Writing Process as my most powerful tool: FINISHING THE MANUSCRIPT. I love finding new things that make my life easier.